Research your audience before you get up to speak. I think most audiences can be classified as friendly, uninformed, or antagonistic. A Toastmasters meeting should be friendly and open to listening to your presentation. This kind of audience is the best kind for trying out new material and getting evaluations of your speech skills. Other friendly audiences are likely to be ones where your topic is perceived as valuable and maybe even worth paying to hear. The other end of the spectrum is the antagonistic audience. I’m recording this podcast in 2016, possibly the year of the most antagonistic political campaigns of my life. It almost feels like some people are making disruption of public speakers into a sport. College campuses see speakers disinvited to events or when a speaker comes, a variety of people might show up to interrupt or shut down the presentation. Antagonistic audiences will challenge your speaking skills with heckling and perhaps even join you on the stage. Between those two is the audience you probably want to reach to inform or persuade. Your presentation skills will have the most influence with them. How do you make a citation in a speech? * It can sound awkward if you’re not prepared. “According to…” is a common way to add a citation to a speech. It’s smooth and simple when you’re citing a person such as an author or an expert. If you find the information on the internet, you may have a problem. You’ve got to use a credible source (How to find a reliable website may help) but if you’re quoting something from Huffington Post or Wikipedia, see if you can find the original source. Wiki usually has a link to its sources (yes, you have to check those too) but Huffington Post, while it often posts reprints, does sometimes print original material. 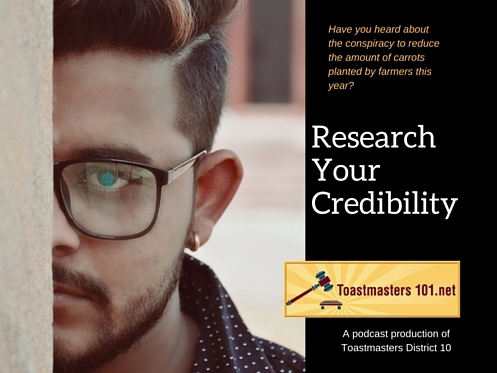 You need to be careful because you don’t want to lose your credibility with your audience. The Carrot Suppression Conspiracy? Completely false. I made it up. But here are some links to some of the things I talked about in the podcast. It’s your reputation on the line here. Protect your good name by treating sources carefully and reliably reporting them in your presentation. If you’re giving a speech with a handout in a Toastmasters meeting, ask the club sergeant-at-arms to assist you if you decide not to have the material on the audience’s seats or on the table before the meeting starts. The sergeant-at-arms can distribute your handouts during your presentation and make sure that everyone gets one. It’s almost always speech contest season with Toastmasters. If you don’t want to compete, there are plenty of other tasks that a speech contest requires. Talk to your club president to find out who is serving as the Contest Chair and volunteer to help.